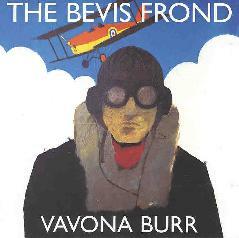 The Bevis Frond - "Vavona Burr"
The latest from The Bevis Frond is the third in a row that features the Frond in a return to a Nick Saloman solo project. Well, he does get help on "The Frond Cheer" as guest Country Joe McDonald gives us an F-R-O-N and a D. Vavona Burr doesn't offer anything new but will nonetheless please those of us who enjoy Saloman's song-oriented acid rock. He has a distinct sound and voice which conveys real emotion in both music and song. This collection of 18 tunes offers up more of the Frond's raw garage style of crashing acoustic and electric guitars and the assorted molten acid solos. Saloman is equally comfortable in easy paced moments and heavy acidic stretchouts. On the lighter side, "Caught In The Headlight" a nice acoustic tune with a sort of sitar sounding solo and a great wailing organ. "One Leg Sand Dance" is a jamming bluesy, and quite soulful, psych rocker. He demonstrates his flare for good rockin' and catchy melodies on tracks like "Couldn't Care Less" and "Almost Like Being Alive". "Coming Down On You" is another great 'stick in your head' melody rocker that has a bit of a Beatles influence. And for all-out acid rock my favorites are "National Drag" and "Temple Falls". "National Drag" got my toes tappin' with its raw slide guitar and screaming echoed solos. And "Temple Falls" features Nick's cool wailing wah-wah licks. There aren't any really extended instrumental stretchouts here. "Begging Bowl" is the longest track at eight minutes, and while it's got some great acid guitar it's still primarily a song, which is really the focus of Vavona Burr.